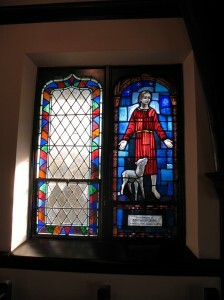 The Shepherd Window: “Lost and Found” | When I Survey . . . When I was growing up my family went to the Church of the Holy Communion in Norwood, New Jersey. It was a little church, built in the neo-Gothic style so beloved by Episcopalians. It had a cloister that connected the church with the parish house. Years later, when I had sabbaticals at Oxford and Cambridge, I felt right at home among the grand stone piles. When I was in second grade a classmate of mine died in a sledding accident, and his family donated a memorial window to the church in his memory. That window helped shape both my faith and my theology. This entry was posted in Christian faith, Christian Hope, dying, Faith, United Church of Christ. Bookmark the permalink. Thanks for the nice comment Paul. You never told me this before. And, of course, we don’t know the other half of my story and never will.